What is Gospel-Centeredness? What could be the pitfall(s) of Gospel-Centeredness? Don’t Be More Gospel-Centered Than Jesus from The Gospel Coalition on Vimeo. I love detective shows. I’ve always been fascinated with the likes of Matlock, Perry Mason, and Columbo. The mystery, intrigue, and suspense they present are irresistable, at least to me. I have also come to love another detective show that has captured my attention, Monk. “Adrian Monk (Tony Shalhoub – pictured above) was once a rising star with the San Francisco Police Department, legendary for using unconventional methods and out-of-the-box thinking to solve some of the department’s most baffling cases. But after the tragic (and still unsolved) murder of his wife, a devastated Monk became obsessive-compulsive. Now plagued by various phobias, almost everything causes him angst: germs, heights, crowds – even milk. His condition eventually cost him his job, and continuously poses unique challenges as he goes about his daily life.” He is an unlikely hero. Think of Sherlock Holmes with the personality of Rain Man. He has an amazing ability because of his extraordinary attention to detail. Other detectives see what Monk sees, but they don’t see what he sees. Monk sees the world, an ugly world, like a child sees something for the first time. Monk, in the second to last episode of Season 3 – “Mr. Monk and the Election”, says something that got me thinking. In this episode, Monk’s new assistant, Natalie, becomes a candidate in the upcoming school board election because her daughter’s school was about to be closed as a cost-cutting measure. Natalie’s frustrations with a jammed photocopier and other defective equipment bought at a police auction are dwarfed by fear for her life when a sniper fires into her campaign headquarters, further damaging the equipment and killing a security guard. The sniper also left a note demanding Natalie leave the election. Suspicion falls on Natalie’s opponent in the election, Harold Krenshaw, whom Monk knows as a fellow patient of Dr. Kroger’s (Monk’s therapist). Krenshaw also suffers from OCD but with slightly different characteristics. What Is Christ-Centered Preaching ? 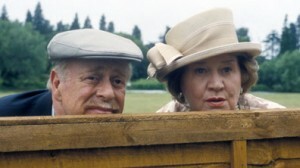 One of the shows out in Television Land that has captured my attention is Keeping Up Appearances. The show demonstrates what people do instead of living out the Gospel. They keep up appearances. The Law is God’s instructions concerning the moral, social, and spiritual behavior of His people found in the first five books of the Bible. The Law is the very reflection of the nature of God because God speaks out of the abundance of what is in Him. Therefore, since God is pure, the Law is pure. Since God is holy, the Law is holy. The Law consists of the 10 commandments (Exodus 20), rules for social life (Exodus 21-23), and rules for the worship of God (Exodus 25-31). It .. is unable to deliver us into eternal fellowship with the Lord because of Man’s inability to keep it. The Law is a difficult taskmaster because it requires that we maintain a perfect standard of moral behavior. And then when we fail, the Law condemns us to death. We deserve death even if we fail to keep just one point of the law: “For whoever keeps the whole law and yet stumbles in one point, he has become guilty of all” (James 2:10). The law made nothing perfect (Hebrews 7:19). That is why the Law has shown us our need for Jesus and the free gift we receive through Him (Galatians 3:24). I have been contemplating revamping the site for a fresh start. Over the years, I have been partial to Movable Type as a publishing platform (still am), but the feature set is no longer where I need it (or want it). So I am switching to WordPress. If this doesn’t make sense, that’s ok. You can skip this post and wait for more to come! 17Therefore, if anyone is in Christ, he is a new creation. The old has passed away; behold, the new has come. 18 All this is from God, who through Christ reconciled us to himself and gave us the ministry of reconciliation; 19 that is, in Christ God was reconciling the world to himself, not counting their trespasses against them, and entrusting to us the message of reconciliation. 20 Therefore, we are ambassadors for Christ, God making his appeal through us. We implore you on behalf of Christ, be reconciled to God. 21 For our sake he made him to be sin who knew no sin, so that in him we might become the righteousness of God. In other words, the Gospel Changes Everything. It produces a Fresh Start. So, let’s get started.